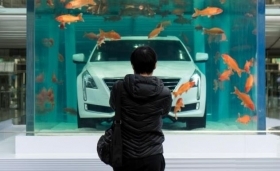 A man looks at a Cadillac CT6 displayed inside a fish tank during an event promoting the car's environmental-friendly features, in Shanghai, China, in February. DETROIT -- Chinese consumers' continued preference for luxury brands could help make that country Cadillac's largest global market in the next five to 10 years, the head of General Motors China said today. The automaker is now producing many of its Cadillac models in China, which enables it to price those vehicles -- including the recently introduced XT5 crossover -- more aggressively against some of its imported competitors, including Ford Motor Co.'s Lincoln brand, according to Matt Tsien, president of GM China. China already is the world's largest market for another GM brand, Buick, and now represents 37 percent of the company's global sales. Last year, GM's share of the China market was 14.9 percent, which should remain steady or grow slightly as the overall market climbs to about 30 million sales in 2020, Tsien said. While industry growth has slowed to 3 percent to 5 percent a year, luxury cars and crossovers are experiencing double-digit gains, he said, noting the Chinese government also is promoting greater investment in so-called "new energy" vehicles -- Beijing's shorthand for electrified cars. GM, along with local partner SAIC, plans to launch more than 10 new electrified vehicles in China by 2020, Tsien said, including plug-in hybrids and pure battery-electric vehicles. Those models will be sold by the Chevrolet, Cadillac and Baojun brands, he said. Asked if China could be an even larger market than the United States for the upcoming Chevrolet Bolt EV, Tsien said, "China is potentially a larger market for EVs, period." GM China will begin producing a plug-in hybrid version of the Cadillac CT6 later this year and that model will be exported to U.S. dealers. Tsien would not confirm plans to offer a plug-in hybrid version of the China-built Buick Envision that goes on sale this summer in the U.S. But GM China showed a concept version of the Envison hybrid at last year's Shanghai show and U.S. supplier sources familiar with GM's plans say a production version could come to the United States as early as 2017.